Prelit Christmas trees take the aggravation out of untangling wires and trying to get the lights arranged artistically around the tree. Because the lights are already attached, you don't have to worry about whether to spiral the strings around the circumference or drape them from the treetop to the lower branches. The manufacturer takes the responsibility of making sure that the twinkling lights are spaced evenly so you don't have to. Even if you've lost the instructions for your prelit Christmas tree, putting it together and plugging it in is mostly intuitive. 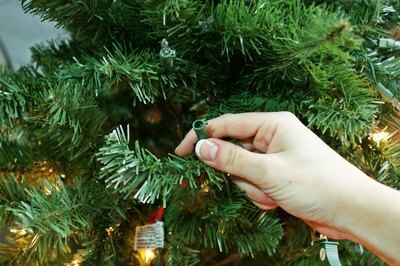 Place the largest tree section into the Christmas tree stand, and tighten the nuts to hold it firmly. 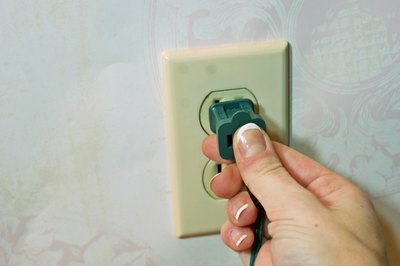 Plug the light plug into the electrical outlet to ensure that all the lights light up. Unplug the tree from the wall. Insert the middle section of the tree into the bottom section. Line up any grooves, arrows or markings on the two sections that help you align the plugs with each other. If none are indicated, turn the middle section to line up the plug for its lights with the extension cord outlet at the top of the lower section. Plug the tree into the wall again to test the lights. Continue adding sections to the tree one by one as described, lining up the electrical plugs of the section above with the extension cord end of the section below. Test each section as you add it so you can easily locate any missing or loose bulbs. 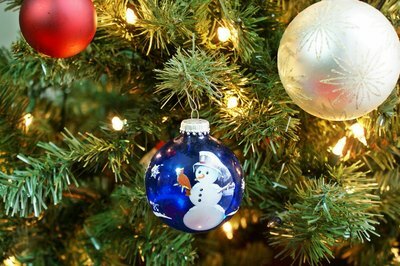 Plug the bottom string of lights into the wall outlet or into the switch provided by the manufacturer. Check the unlit section for missing bulbs. A missing bulb breaks the electrical circuit, and any bulbs after it will not light. 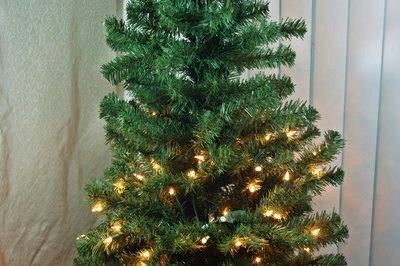 Replace the missing bulb with the size and brand recommended by the manufacturer of your prelit tree. 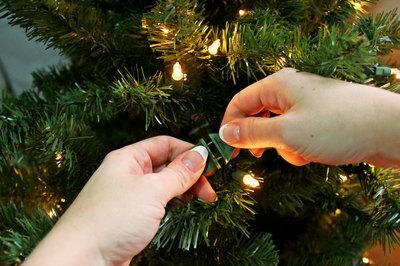 Push each bulb in the unlit section firmly but gently into the base. Loose bulbs also break the electrical circuit and prevent the rest of the string from lighting up. In most cases, replacing missing bulbs and tightening loose bulbs will resolve any problems. Check the plug for the Christmas light string that is not lit for a fuse container cover. Slide or flip it open to access the fuse. 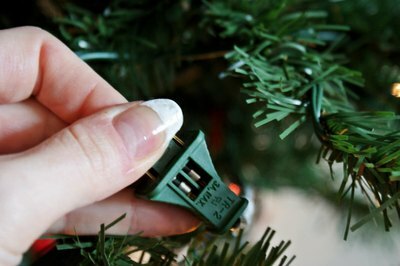 Pop the fuse out of the plug, and replace it with the type of fuse recommended by the manufacturer of the Christmas tree.